We are not an ‘off the shelf’ training courses provider. Our training and coaching solutions are built just for you and we do this by working with you to understand how the emotional, behavioural and cognitive components of your employee behaviour positively or negatively impact your business. Our courses and workshops are designed specifically for your team, addressing the actual challenges they face, in the environment they face them. We include scenarios from your workplace, using the language your team use and delivering the precise outcomes you need. Powerful Patterns in People – what motivates our behaviours and thought processes in the workplace. This workshop takes your team through an eye-opening, heart-opening and “aha moment creating” journey. Metaprograms are the mental filters that we all have. These filters govern the way we think, process information, work, our preferences, our attitudes, what we see, what we attend to, and what we dismiss. This is the most comprehensive way for your team members to get to know one another, truly understand their similarities and differences, and come away with a plan to build cohesion, team relationships that really work, productivity, effectiveness and engagement. This full day workshop explores specific work related metaprograms. Participants get a deeper understanding of themselves and their co-workers and concrete plans for how to increase their effectiveness, productivity, team relationships and appreciation for individual differences. The day is interactive and fully engaging and filled with useful information, tools, strategies, techniques and fun. Effective leaders and managers empower their people to become the best employees possible. Empowered staff will lead your organisation toward greater success by aligning their abilities and competencies towards the strategic direction of the business. This course addresses the unique and specific skills required to harness the power of your employees through coaching for performance improvement. Coaching skills include attentive listening, strategic questioning, keen observational ability, and the appropriate mindset, one based on honesty with compassion and integrity. 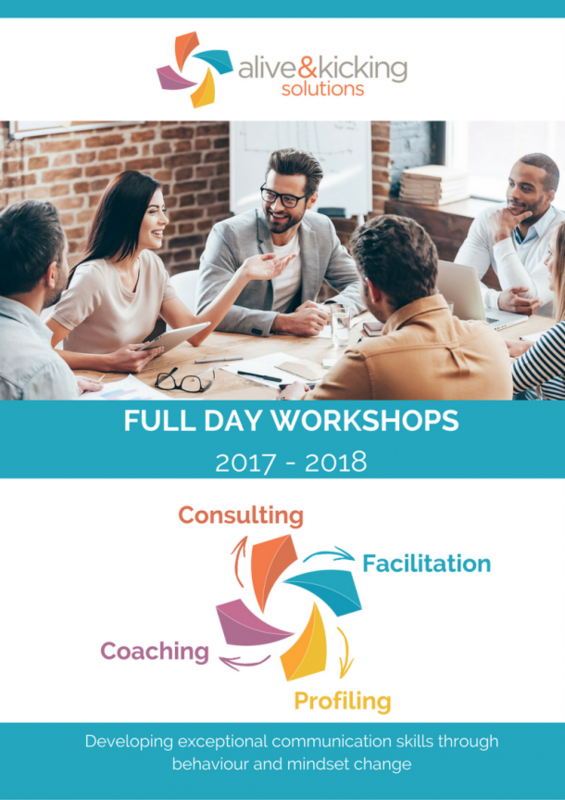 Alive & Kicking Solutions has trained hundreds of people to be workplace coaches over the years and has now distilled the best elements of our 5 day course in to this one day, hands-on workshop. It is specifically designed for leaders and managers to learn some of the most critical skills needed to be able to drive performance and achieve KPIs. Increasingly employees are asked to achieve more with less, to secure customer satisfaction and loyalty in highly competitive markets, and sometimes whilst faced with the uncertainty of their future employment therefore optimal performance requires greater resilience. Resilient people are far more capable and confident to handle challenges, they are better able to cope and to thrive in the face of uncertainty and the unknown. With the workshops being run over a period of three months, participants are able to put specific skills and strategies into place, and then return to the facilitator at subsequent workshops and discuss what is working for them and how to correct what is not working. Resilience levels in all participants increases over the program’s duration.